LINES, VINES, AND JONAS TIMES: JB blogging about PR, new album, & finished filming JONAS ! JB blogging about PR, new album, & finished filming JONAS ! Last night we has our 2nd show in Puerto Rico. The first time we came was over one year ago. There were not many people there but we loved it and we have been excited to come back ever since. Last night we were in an arena with so many people. The people here are so passionate! They were into the music from the first beat and it felt so good to be back on stage doing our songs. It made us even more excited for this year’s tour. We can’t wait to do the new songs and see everyone again. Today we get to relax and take a little break before heading back to California to finish the new CD. We have been working hard in the studio and we can’t wait for you to hear the music. 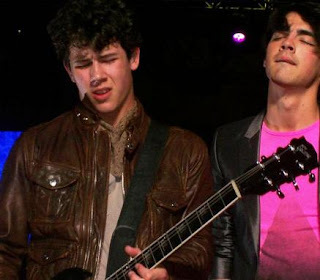 We finished filming the TV show, JONAS. We had fun doing it and the cast and crew are amazing! It is going to premiere in May. We really hope you will like it.